A very pure manuka honey that has been independently verified by a lab. A highly delicious honey produced by Steens – an innovative and leader in manuka production. Steens produces some of the finest manuka honeys in the world and this UMF 20+ Raw Manuka Honey is a pure and high quality honey by Steens, a company that has been both a pioneer and innovator in the production of manuka honey. The company’s ethical and sustainable foundation has been the bedrock to this innovation. Consumers of honey need to assured they are getting the highest quality product and Steens UMF 20+ Raw Manuka Honey is 100% pure unadulterated manuka honey that has not been heat treated or processed in any way except to remove the wax. To think of it another way it is as though you are dipping your fingers into the honeycomb – yum. This means that you not only get 100% of the taste but you also get 100% of the goodness the honey contains including enzymes, bee pollen, minerals and vitamins, and that’s the meaning of raw honey. If you are looking for a pure manuka honey and want to be certain the contents are genuine manuka then the UMF label is one way of ensuring that the contents of the jar are what the label says. Steens manuka honeys are tested by a laboratory in accordance with the very latest research into the unique and naturally occurring chemical markers that must be present for the honey to be be classed as genuine manuka. Steens manuka honey is now licensed with the UMF trademark label and this means the honey has been tested verify the presence of these naturally occurring elements such as the honey’s MGO level and for something called Leptosperin, which is unique to manuka honey. You can actually trace your jar of manuka honey thanks to the company’s innovative Hive Tracker software. See for yourself where your delicious jar of manuka honey originates from. 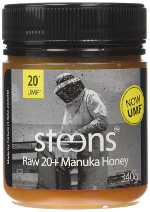 Click on the link for an in-depth review of Steens UMF 20+ Raw Manuka Honey. 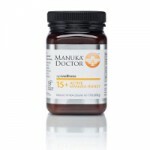 Manuka Doctor Manuka Honey can be traced back to its beekeeper. A delicious everyday honey - once the jar is opened you will find it irresistible. 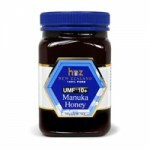 Honey New Zealand have a range of UMF manuka honeys with a variety of UMF ratings. HNZ have been making handcrafted honeys for decades with honey sourced from master beekeepers around New Zealand. 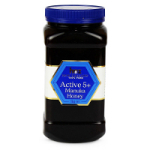 A 250g jar is perfect for testing if this is the manuka honey for you!